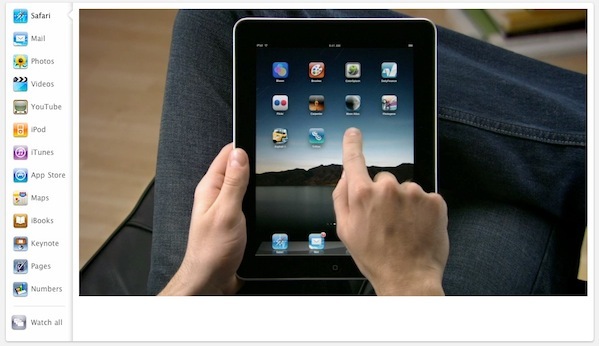 Did you know that Apple offers free video tutorials for using the iPad? They’re incredibly easy to follow and well worth watching if you’re new to the iPad or just know someone who is. Topics covered include a broad range of valuable iPad related interests, including: Safari and browsing the web, Mail and how to write and respond to emails, Photos, Videos, YouTube, iPod, iTunes, App Store, Maps, iBooks, and the productivity suite; Keynote, Pages, and Numbers. The iPad and iOS interface is pretty intuitive but that doesn’t mean that a little help won’t go a long way. These have been a lifesaver, not because I personally need them – my family members do! When my aunt first got an iPad I constantly got emails and calls from her asking how to do this and that. Finally I figured out that Apple has the guided tours, so I sent her the URL to watch the tutorials… they have been a big help. Then again, if you’re coming to iPad from an iPhone then you’ll find it easy because the interface is basically the same, just larger, but nonetheless these vids should be helpful to some users out there. Enjoy. Don’t forget to check out our vast archives of iPad tips, tricks, and topics here too, you’re sure to find many helpful tidbits! I assume that they also playback on the iPad itself nicely? The only video I see there now is a tv ad. I can’t find a decent video tutorial anywhere.